Appeared at the end of last year, the category "M" (mopeds and scooters) presented to future participants of traffic requirements. If the scooter could travel any person from 12 years, now need to get a driver's license for driving that vehicle. 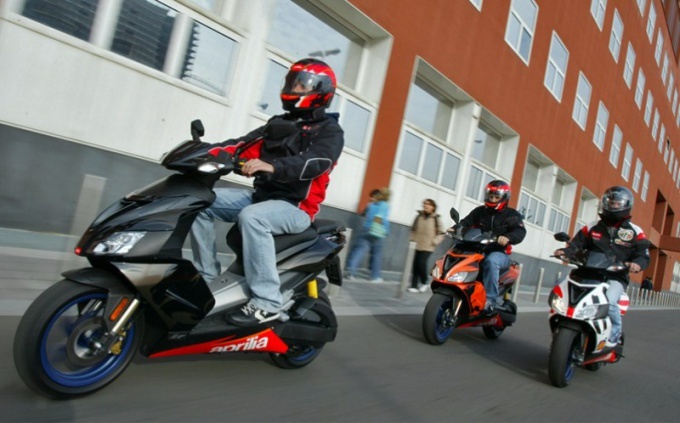 The introduction of a new category while felt significantly only in the big cities, where almost every driving school teaching Teens and adults to drive a scooter. In small towns training on a category "M" has not received special popularity – the majority of those who ride on two-wheeled transport prefer to learn from familiar to all "a" category. In order to pass the exam for a driver's license category "M", you must be 16 years of age. It is 5-10 thousand rubles (in different regions of the country, the prices for training in driving schools vary). It is expected that the course will include the study of standard rules of the road and a little practice, although the latter is not available in all driving schools. Theory course for any category of the driving licence lasts for about 1-1,5 months at the end of which you will need to pass the so-called internal exam (competition on knowledge of traffic rules). If you do not pass the exam the first time, you will be assigned re-sit and give time to prepare. After passing an internal examination in driving school, you can begin to practice. Yet it is not known what number of hours will have to cover students in the category "M". At the end of training you will have to show the standard marker "g", the corridor, half circles, snake, acceleration and deceleration on a straight line motion at a low speed, etc. If you are doing a great job with these figures the internal exam for practice, you can safely go to the traffic police and to show their skills to inspectors. In recent years, the country began to appear the trend of self-exam for a driver's license. If you have previously ridden a motorcycle or a moped, a well know theory, you can call or come to the traffic police at the place of residence and to arrange the exam. It is also possible to exam with the driving school or on their own in another city or region. When you do it this way you should get a certificate from the traffic police at the place of residence which says that you have not previously deprived of their rights or do not have a driver's license in another category. It is best to come to traffic police and to learn about the order of carrying out examination driving a scooter in advance, as the phone is unlikely to give you all the necessary information (phone often busy). If you will take the exam on the category "M", it is necessary to know in advance about what documents you will need. Otherwise, you will have to go back to his hometown and long to gather information. In conclusion, it is worth noting that after the introduction of new categories including "M", there is a lot of confusion, and programs for students under the new rules still do not clearly formed. If you don't want to just spend the time and money, you should also specify the cost of training, modes of transport correspond to a particular category, the learning process, the number of hours of theory and practice and other important details.